Although the outfit on the right is more of a color and texture swap akin to the earlier revealed screenshot of Link's SS-based "recolor," the left image is clearly a full outfit change. Coupled with the "gender swap" models some characters have, it's possible most, if not all, characters may get a proper alternate outfit/model. What are your thoughts? And what outfits would you like to see? I'm hoping for Royal Engineer and Outset Toon Link myself, and perhaps a Hilda swap for Zelda. I haven't really paid that much attention to the character palettes, but it does seem like they're going all-out this time. Still, it's not like they haven't gone to decent lengths before. If memory serves me correctly, all of the Four Sword Links were in the last game, as well as Dark Link and a gold tunic to reflect the Gold ChuChu jelly. There was also Samus with her various outfit changes in Metroid Prime. However, I am interested in seeing what else they're going to do with the rest of the character costumes. Color diversity was never an issue, but normally there weren't design changes, just color swaps. Snake was a notable exception, and some characters that got accessory swaps, like Pikachu and Jigglypuff. This time around they're doing full alternate models for way more characters, and even the "color swaps" have more intricate designs now. I'm really excited to see more of these outfits. Didn't they announce a Skyloftian costume for Link...? Or was that something else...? either way, that's something I'd like to see. The Ordonian costume, too. 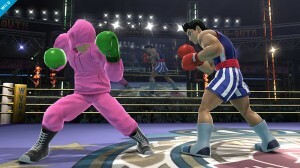 But as you can see it's not a model swap like that jacket Little Mac or the gender swaps. It's more like that right hand Little Mac outfit in that it's just an elaborately designed version of the base model. Ahh, so I was remembering that right (nice to know I'm not going prematurely senile ). Kinda wish they'd left out the hat, though, because it just looks like a few different colours were added. Ahh, well. I shouldn't complain too much.